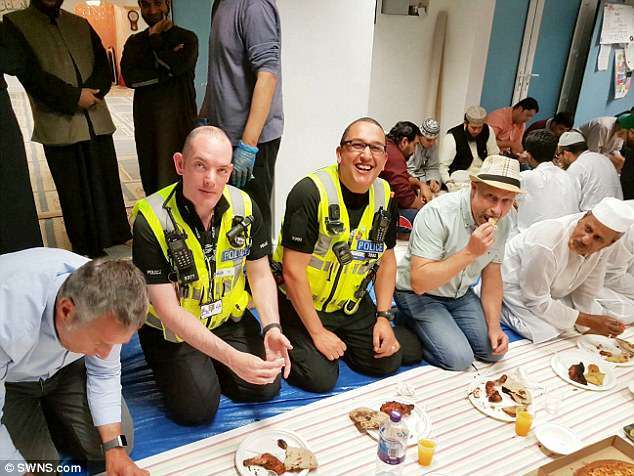 “Non-Muslim police officers have taken part in an 18-hour fast for Ramadan to help boost relations with the Islamic community. 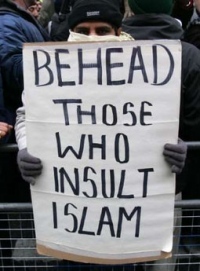 Northamptonshire Police said the move was to ‘show unity’ and ‘gain a better understanding’ of the local community during the Muslim holy month. PSCO’s were this week pictured at the Headlands Mosque in Northampton, joining in with the evening iftar meal having fasted from sunrise to sunset. Northamptonshire Police said the move was an attempt to get ‘deeper into community roots’ while the mosque also welcomed the officers’ participation. Trustee of the Mosque, Mr Ayub Abdulla, said: ‘It was heartening to see people from the police taking part in the fast and joining us with their families for the evening meal. Positive Action Officer, Kamilla Poole, said: ‘Fasting for the day with no food and water was quite an experience and I realised that it requires a significant level of dedication and self control to do it. Chair of the Northamptonshire Association of Muslim Police, Sophia Perveen, said: ‘When organising this event, I didn’t expect officers or staff to fast, as it can be quite a shock to the system, however it was really encouraging to see them give it a go. Makes one wonder how they ate ordered to relate to the local homosexual community.